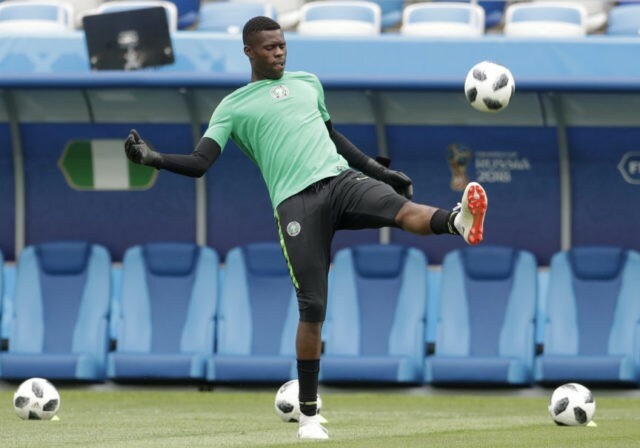 Nigeria coach Gernot Rohr has handed a World Cup debut to 19-year-old goalkeeper Francis Uzoho for his team’s World Cup opener against Croatia. Croatia’s midfield is powered by Real Madrid’s Luka Modric and Barcelona star Ivan Rakitic. Coach Zlatko Dalic has left Modric’s Madrid teammate Mateo Kovacic on the bench. Kasper Schmeichel’s slew of saves made Yussuf Yurary Poulsen’s opportunistic second-half goal stand up in a 1-0 victory over Peru. Though FIFA rules prohibit political statements at games, soccer’s governing body says the banner was a “social appeal” displayed during Iran’s 1-0 win over Morocco on Friday. FIFA has worked with Iranian authorities toward relaxing Iran’s ban since 1979 of women attending male-only sports events. The slogans “#NoBan4Women” and “Support Iranian Women to Attend Stadiums” were held aloft at both ends of the St. Petersburg stadium. Belgium coach Roberto Martinez believes the Red Devils could have defenders Thomas Vermaelen and Vincent Kompany back from injury during the group stage, but he’s waiting until the final deadline before setting the team’s 23-man roster. Martinez says Vermaelen could be ready for the final two group games, and the target for Kompany is Belgium’s last group game against England. Belgium opens the tournament Monday against Panama. Kompany injured his groin in a warm-up match against Portugal earlier this month, continuing a long history of injuries. Martinez said the team will wait until Sunday’s roster deadline before making a final decision on Kompany. The 34-year-old Guerrero is Peru’s top goal scorer in history. He did not start because of his lack of action in recent months after a doping ban. Guerrero’s suspension was overturned a few weeks ago by a Swiss judge. Denmark’s Yusuf Yurary Poulsen opened the scoring against Peru in the 59th minute after taking a pass from Chistian Eriksen. Referee Bakary Gassama of Gambia went to the video after Cueva fell in the penalty box after an intervention from Denmark’s Yurary Poulsen. Denmark lost Willian Kvist to injury in the 35th minute after a collision with Peru’s Jefferson Farfan. Kvist was replaced by Lasse Schone. Switzerland’s coach and captain have told fans not to expect an entertaining game against Brazil on Sunday — their goal is to deny the Brazilians space in the Group E match. The 34-year-old Guerrero is his country’s all-time leading scorer with 35 goals but has missed a lot of action because of a doping ban that was lifted only weeks ago by a Swiss judge. Ridiculing Russia’s national soccer team may soon be against the law. With Russia hosting the World Cup, lawmaker Vitaly Milonov is working on a bill to impose fines on anyone insulting players or the coach. Milonov is known for championing legislation against gay “propaganda” toward minors. Milonov’s office says he will present the bill to colleagues at the State Duma next week. While Milonov is from Russia’s dominant party, it’s unclear how many other lawmakers would support the provocative idea. Defying expectations, the team trounced Saudi Arabia 5-0 in the tournament’s opening match. Messi failed to restore his team’s lead when his 64th-minute spot-kick to Hannes Halldorsson’s right was at a good height for the goalkeeper to get two strong hands behind the ball. Iceland levelled four minutes later via Alfred Finnbogason’s volley. The tiny Nordic island team created several first-half chances despite having only around 25 percent possession, and put up a solid wall to deny Argentina’s waves of second-half attacks. Lionel Messi’s penalty woes have continued. Goalkeeper Hannes Halldorsson has saved a Messi penalty kick to keep Iceland level with Argentina midway through the second half. Halldorsson went to his right and easily parried Messi’s shot. The Fare Network, which helps FIFA and UEFA investigate cases of discriminatory behavior by fans, had planned to operate “diversity houses” in Moscow and St. Petersburg with exhibitions and talks on human rights. However, Powar says Fare has only “anecdotal evidence” of the city government’s involvement. A Sergio Aguero strike in the 19th minute was canceled out just 4 minutes later when Alfred Finnbogason swept a loose ball into the Argentina net off another broken play by the South Americans’ defense. Iceland, the smallest nation ever to qualify for the World Cup, has been content to surrender most of the possession but the chances have fallen fairly evenly. Iceland’s strategy of long-range counterattacks and pressuring the Argentines’ shaky backline seems to be working. Gylfi Sigurdsson’s volley just before the break was the last of those, but it went wide. Alfred Finnbogason buried a rebound off a broken play by Argentina’s defense to bring Iceland level just minutes after a Sergio Aguero strike had given the South Americans the lead at Moscow’s Spartak Stadium. Iceland missed a fantastic chance in the 10th when their pressure forced a breakdown on Argentina’s backline. Caballero was forced to stab away an ill-advised back pass, and the ball wound up at the feet of Kari Arnason, whose volley missed a fairly open net. The South Americans did politely quiet down long enough for Iceland fans to get in the first of their famed “Skol” chants and a song of their own. But the few sections of fans wearing Iceland’s dark blue are nearly swallowed up by the sea of sky blue-and-white Argentina jerseys. Iceland is the least populous nation ever to play in the World Cup. The entire country’s population is only about seven times bigger than the stadium’s capacity. Lionel Messi is joined in Argentina’s attack by the fit-again Sergio Aguero to face Iceland at Spartak Stadium in Moscow. Aguero had knee surgery in March but returned in a warmup friendly against Haiti two weeks ago. Iceland’s No. 10 Gylfi Sigurdsson is fit to start despite, like Aguero, ending his English Premier League season in March because of a knee injury. Coach Heimir Hallgrimsson has opted for Alfred Finnbogason to lead the attack in a likely 4-5-1 formation. It’s the first game in Group D. Croatia plays Nigeria later Saturday. Pogba was unimpressive until the 81st minute at the Kazan Arena, when he set up a fine one-two with substitute Olivier Giroud to beat Australia ‘keeper Mat Ryan with a shot that took a deflection, hit the bar and crossed the goal line. After a balanced first half, France was awarded a penalty following a VAR review, the first of the World Cup, and scored to take the lead in the 58th minute. After checking images of a tackle from behind by Joshua Risdon on Antoine Griezmann, referee Andres Cunha pointed to the penalty spot. Griezmann sent a powerful strike into the net that left ‘keeper Ryan stranded. After checking images of a tackle from behind from Joshua Risdon on Antoine Griezmann, referee Andres Cunha pointed to the penalty spot. Griezmann sent a powerful strike into the net that left ‘keeper Mat Ryan stranded to give France a 1-0 lead. Germany coach Joachim Loew says goalkeeper Manuel Neuer is looking confident ahead of the team’s World Cup opener against Mexico, despite missing most of the season with injury. Neuer, a star of Germany’s World Cup-winning team in 2014, played just four times this season for Bayern Munich because of a fracture in his left foot. Ahead of Sunday’s game against Mexico, Loew revealed Germany spent Friday concentrating on corners, free kicks and penalties to deal with a perception that set-pieces might be a weak point for the 2014 champions. It’s 0-0 at halftime between France and Australia in their World Cup Group C opener in Kazan. Applying coach Bert Van Marwijk’s orders, the Socceroos are putting on a composed but aggressive display that has been working well so far. Julian Draxler says it’s “not true” that his Germany teammates Mesut Ozil and Ilkay Gundogan are feeling isolated in the squad following controversy over their photo with Turkish president Recep Tayyip Erdogan. Arsenal’s Ozil and Manchester City’s Gundogan, who are both of Turkish descent, posed with Erdogan during the Turkish president’s visit to Britain last month. Gundogan, who gave Erdogan a shirt with a message “to my revered president,” was jeered by fans during last week’s friendly win over Saudi Arabia. Paul Pogba, N’Golo Kante and Corentin Tolisso have been selected in a three-man midfield, with Benjamin Pavard, Samuel Umtiti, Raphael Varane and Lucas Hernández making up the back four. France: Hugo Lloris, Benjamin Pavard, Raphael Varane, Samuel Umtiti, Lucas Hernandez, Corentin Tolisso, N’Golo Kante, Paul Pogba, Antoine Griezmann, Ousmane Dembele, Kylian Mbappe. Laurent Ciman has left Belgium’s World Cup squad, the team says on its official Twitter account, although it has not said if the defender’s departure means that center back Vincent Kompany is fit again after injuring his groin in a warmup match two weeks ago. Coach Roberto Martinez took Los Angeles FC defender Ciman to Russia as a stand-by player in case Kompany was not fit for Belgium’s opening Group G match against Panama on Sunday. They’re now looking forward to Saturday’s game between Croatia and Nigeria. While fans from around the world are singing and celebrating the World Cup on Moscow’s streets, they can’t go to the most famous place in the Russian capital — Red Square. Russian police have closed off a number of roads and other areas for security reasons over recent days. It’s unclear when the square will be reopened.